Ever since my first winter camp when someone told me how much warmer it was inside a quinzhee, I wanted to have a way to measure that to quantify exactly what the difference would be. I'd searched half-heartedly since then for a cost-effective solution, but it was not until just before our Scouts 2nd fall camp in November past that I really start searching in earnest. 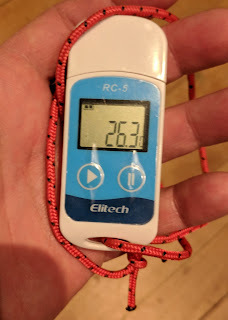 And luckily I found the perfect item - the Elitech RC-5 USB Temperature Data Recorder. These devices are used in the medical supply and pharmaceutical industry when drugs and other biological supplies are shipped and have to be maintained at a constant temperature otherwise they cannot be used. One of the data loggers get packed into the box with the item being shipped, and then the data is read from the device at the other end to ensure the supplies were always kept within the required temperature range. Aside from knowing the temperature differential inside a quinzhee or igloo, I also just find it generally useful to have a log of temperatures over the course of a camping trip or other outdoors outing. I like to keep notes on my camping trips on what conditions were like, what gear I used, and how the gear performed. A key part of knowing how well your gear performed is having accurate temperature data. For example, it is useful to record in my notes "my brand X sleeping bag was a bit chilly overnight", but it is far more useful to know exactly what the temperature was.